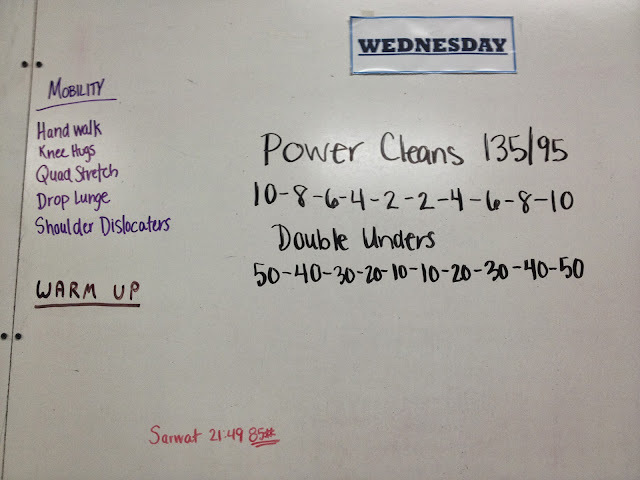 You do 10 power cleans and then 50 double unders (I did 150 singles jump rope) and then back to power cleans with 8 reps and so on. Power cleans at 85 lbs was hard and I kind of gave up after the first 8 and took of some weight and used 75 lbs but then it was too easy so I went back to 85 lbs on the 2 rep rounds and stuck with it even though I was breaking them down into 3 reps at a time to finish. Still, I think this means I can't go back to 75 lbs in a WOD! Wednesday night was my first bike ride in almost 2 weeks! Between traveling, the rain, and being sick, I just haven't been out there. It was a night ride at Lake Crabtree park and it was pretty fun. We did two laps so I think I got in about 12-13 miles? I didn't keep track. I can't wait to bike again!